Artists have a unique opportunity to affect the viewers and listeners of their works on a deep level, Israel Kamakawiwo'ole (pronounced caw-ma-caw-vee-vah-o-lay) is a musician who did just that. 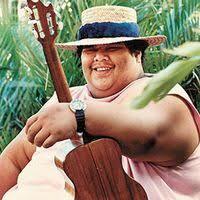 Known more commonly as Braddah Iz or just Iz, Israel was a native Hawaiian singer/song-writer and activist. Born in 1959 Israel was known by family and friends as a gifted musician by an early age, performing at just ten and going on to form a band—The Mahaka Sons—where he would begin his rise to fame. Iz created music that separated itself from the "Hawaiian music" created for tourists in the century after the annexation of the Kingdom of Hawai'i, going back to traditional roots and actually representing native Hawaiian culture. I decided to highlight his art because I grew up listening to his music and I feel that it represents my culture very well (and sounds beautiful). Many may have heard his version of "Somewhere Over the Rainbow" but may not have heard his other work which reflected his feelings about the treatment of Hawaiians and the islands in recent time. I think that the history of Hawai'i is overlooked, that the islands are written off as a fun tropical vacation and that many of the problems that resulted from the illegal annexation and following statehood are ignored. But Iz's music, which is beautiful in its unique sound, mourns the damage, urges change, and offers a look into traditional Hawaiian culture not easily found elsewhere. I chose Iz because of the expressive, honest feelings his music evokes, the important subject matter of his songs, and a deep personal significance his music has to me. On his website a detailed, personal biography written by his producer offers insight into his rise to fame and includes a brief discography. NPR's Renee Montagne published an article about Iz that includes quotes from him, remarks from close friends, and details of the end of his life (I particularly enjoy this article as it makes reference to an important concept in Hawaiian culture: the idea of 'mana'). And finally I would like to invite any readers to listen to the following pieces: his cover of "Somewhere Over the Rainbow" and his song "Hawai'i '78". In comparing the two I think it is easy to understand his feelings and how he expresses them in his music, it is also an excellent example of how he incorporated ancient Hawaiian music (in this case chanting) into his own. The phrase repeated throughout: "Ua Mau ke Ea o ka 'Āina i ka Pono o Hawai'i" means "the life of the land is perpetuated in righteousness", it is a phrase of great cultural significance that is reflective of the connection ancient Hawaiians had to their land, a phrase that Iz sings beautifully mournfully.